The Polish government has adopted a new law on electromobility aimed to turn Poland into an e-mobility leader in Europe. The country wants to have 1 million EVs on the road by 2025. Already home to electric bus manufacturing plants and a big EV battery plant, Poland is set to become the motor for electrifying transport in Europe. “We are really pioneers”, says Marta Gajęcka, Head of Energy Advisors to the President of the Republic of Poland, in an exclusive interview with Energy Post. Earlier this year, new legislation in the form of the ‘Act on Electromobility and Alternative Fuels’ was approved by lawmakers, setting out the legal framework for Poland’s EV ambition. “There are not so many countries who are putting e-mobility forward as a central component of policy, we are really pioneers in this way,” says Marta Gajęcka, Head of Energy Advisors to the President of the Republic of Poland, in an interview with Energy Post. “Electrifying transport has the potential to enable cheaper and more reliable access to mobility. Electro-mobility forms a central component of the EU’s ambition to decarbonize its economy in line with the Paris Agreement,” she adds. With the new legislation, local authorities are mandated to play an important role in the rollout of electromobility. “Under the Act, e.g. administration in regional authorities (below 50 000 habitants) must ensure that a minimum of 30 percent of their fleet is electric, the same should be the share of electric buses in these regions” notes Gajęcka. To support these developments, subsidies are on offer for the construction of the charging infrastructure for public transport and charging stations for electric vehicles that are used by the local authorities. The market is already moving: in 2017, the Polish Development Fund (PFR) (along with several ministries, amongst others) signed an agreement with 41 local governments for the purchase of 780 electric buses. Poland’s e-mobility ambition is also supported by the presence of global advanced materials company LG Chem which has an EV battery plant near Wroclaw in Poland, currently operating with an annual production capacity of 100,000 batteries. Anticipating a massive shift to electric cars from European automakers during the next decade, LG Chem plans to soon triple the annual production capacity to 300,000 units. In addition, Impact Clean Power Technology, a domestic battery producer, is a major player in e-bus battery production in partnership with key bus OEMs, including Solaris. And Polish manufacturing is making its mark in the electric bus market, with companies such as Solaris, Ursus and Solbus. The electric version of the Solaris Urbino 12 won the accolade of the bus of the year 2017 at the IAA [Internationale Automobil-Ausstellung] motor show in Germany, the first time a Polish vehicle or a battery-driven one has won the contest since it was inaugurated in 1989. 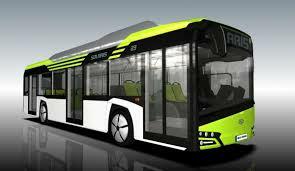 “Next year, twenty-five electric buses made by Solaris will be running in Brussels,” says Gajęcka.